An inflatable balloon in the figure of Uncle Sam outside a private home could be considered electioneering. The Chicago Board of Elections late Tuesday morning was sending an investigator to check out the balloon in the city's West Lawn neighborhood to see if it violates election law. The problem? The private home, on the 3800 block of West 68th Street, is also an official polling location. 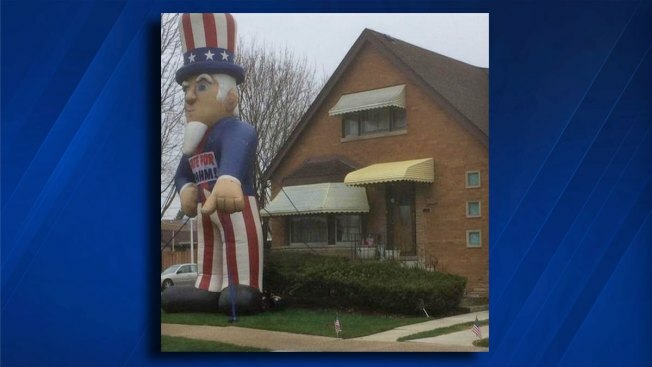 Uncle Sam has a poster with the words "Vote for Rahm" across his chest, and it would be in violation of the law if the balloon is within 100 feet of the home's entrance.